This entry was posted in Month-end, Statistics. Bookmark the permalink. Seems like Alberta is lagging everyone else… for the last few years (since the recession) Alberta stayed relatively flat while other Canadian cities had increases (sales and prices). Now finally Alberta is catching up, while other markets are falling in terms of sales. It should be interesting to see if the trend continues. Do the prices fall significantly in those markets where sales are down dramatically (i.e. Vancouver), and does Calgary go another year or two before it sees things suddenly drop?? Only time will tell. Yeebs – I’ll submit that perhaps the rest of the country is actually catching up to Calgary. We all know the effects of loosening credit through government back mortgages (2004-2007) and interest rates. 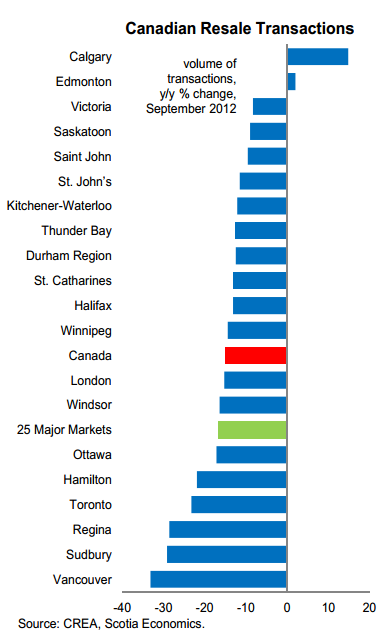 Calgary house prices skyrocketed well ahead of the national average from 2004-2007 (during the period of lofty natural gas prices) and I think Albertans took advantage of longer amorts much quicker than in the relatively slower economies during that period. The result was extreme price appreciation. When markets collapsed in late 2008, Calgary and Edmonton saw the biggest immediate declines, but were spared from a more severe correction as the BoC dropped interest rates to emergency rates (where the remain today). I think AB went through a more protracted boom-bust cycle and the other markets are actually catching up with us now.